And so me seide a drugeman. It has been suggested that residual words are often the most frequently occurring, which will be heard and learned earliest by the child and which are furthermore most susceptible to correction if the child does produce a regularised form like **foots. Some objections can be raised; for instance, ox is not a particularly common noun in modern English - although it probably occurred rather frequently in Middle English. Ox might have been expected to regularise as it became less common, but this decrease in frequency probably overlapped with the rise of literacy, which tends to slow down analogical change. In general, the connection of resistance to analogy with frequency seems to hold. B 2558: Also Ich tofore ȝou saide. ・ Burnley, David. 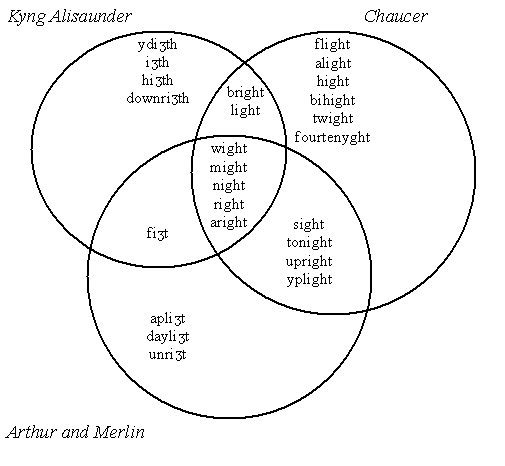 The Language of Chaucer. Basingstoke: Macmillan Education, 1983. 13--15. Ða comon þa men of þrim megðum Germanie: of Aldseaxum, of Anglum, of Iotum. Of Iotum comon Cantwara 7 Wihtwara, þet is seo megð þe nu eardaþ on Wiht, 7 þet cyn on Westsexum þe man nu git hæt Iutnacynn. Of Ealdseaxum coman Eastseaxa 7 Suðsexa 7 Westsexa. Of Angle comon, se a syððan stod westig betwix Iutum 7 Seaxum, Eastangla, Middelangla, Mearca and ealla Norþhymbra. PDE translation: Those people came from three nations of Germany: from the Old Saxons, from the Angles, and from the Jutes. From the Jutes came the inhabitants of Kent and the Wihtwara, that is, the race which now dwells in the Isle of Wight, and that race in Wessex which is still called the race of the Jutes. From the Old Saxons came the East Saxons, the South Saxons, and the West Saxons. 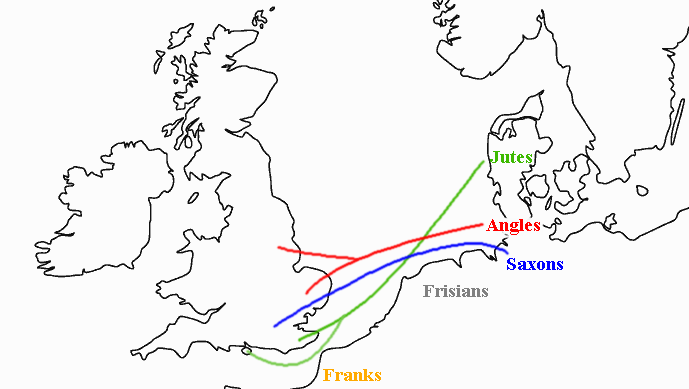 From the land of the Angles, which has lain waste between the Jutes and the Saxons ever since, came the East Anglians, the Middle Anglians, the Mercians, and all of the Northumbrians. ・ Irvin, Susan. "Beginnings and Transitions: Old English." The Oxford History of English. Ed. Lynda Mugglestone. Oxford: OUP, 2006. 32--60. ・ Hoad, Terry. "Preliminaries: Before English." The Oxford History of English. Ed. Lynda Mugglestone. Oxford: OUP, 2006. 7--31.